Hypocalcaemia (low serum calcium) causes a long QT interval. This ECG is from a woman in her 30s who presented with cramping following thyroid surgery. This ECG shows prolonged QT due to long ST segment, no U waves, but also a prolonged QRS and PR. There was hypocalcemia, mild hyperkalemia and hypermagnesemia. 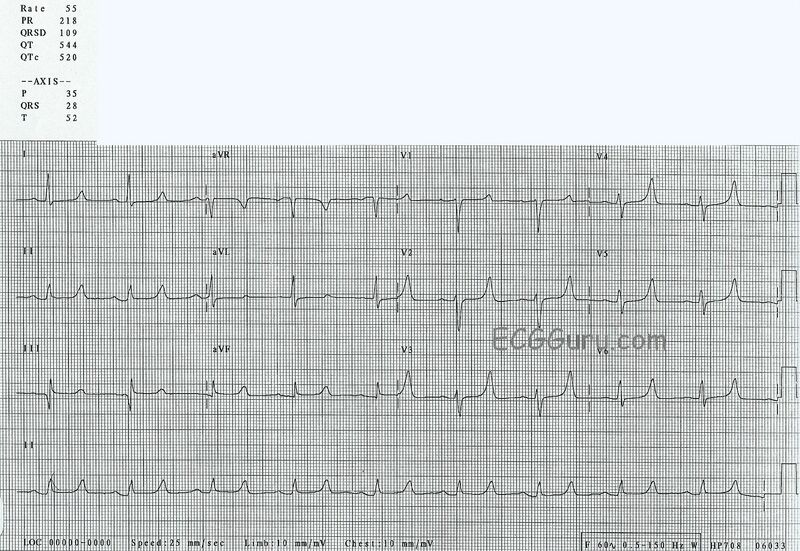 This ECG is from a patient with DiGeorge's syndrome. This ECG is from a patient who had undergone thyroidectomy. This ECG is from a woman in her 40s who presented with weakness and hyperglycemia on a background of diabetes mellitus. This ECG is from an elderly woman who presented with altered mental status. This ECG shows a very prolonged QT interval due to a long ST segment, caused by hypocalcemia.